Review: A young couple go to Paris. Everyday at Midnight the young man is transported back into the 1920’s. Brilliant film!! Woody Allen has done a fantastic job directing this. At the Academy Awards in 2012 Woody Allen won an Oscar for Best Writing, Original Screenplay. That same year at the Golden Globe Awards Woody Allen also won Best Screenplay – Motion Picture. Carla Bruni has a five minute appearance in it. Woody Allen wanted to do this film in 2006 but decided to leave it as it was going to cost too much money. It is very witty and amusing. One film critic wrote “Filled with light-hearted fancy and a dazzling cast. 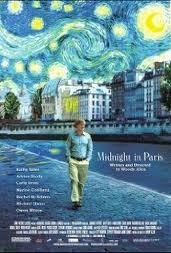 Woody Allen’s latest film is a magical stroll through a magnificent city”.